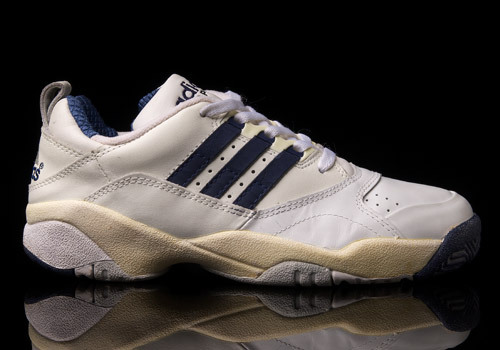 Quite a unique tennis trainer, the Torsion Response Low from ’95, as not every Torsion bar that looks and feels like this, nor are its design details so frequently used. On first glance these may be ugly or boring or normal to some, and that’s fair game. 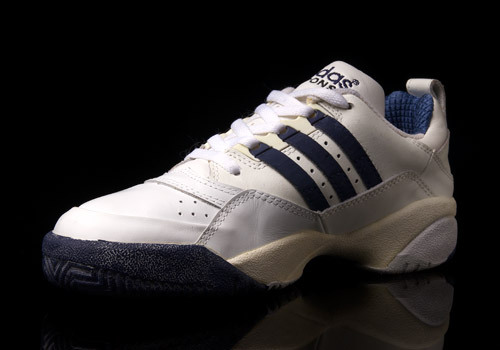 An all white trainer with only a little bit of predictable “marine” blue splashed upon the usual surfaces. But funnily enough if you dig about a bit you’d find that these are far from ordinary, beginning with their elusively plain vanilla design. The all white upper is misleading at first, visually downplaying the amount of overlapping layers and intricate stitching used to build the pair. If you include the pull tab in a count then the heel is composed of five layers of leather alone! 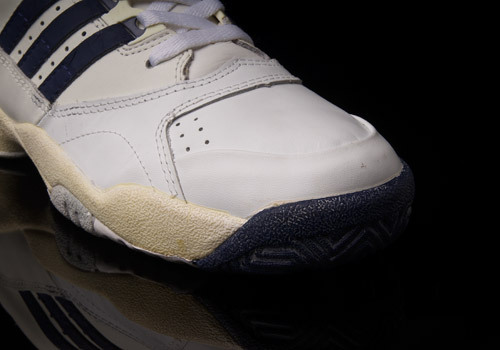 Both the mid sole and inner lining are constructed from multiple pieces and while that’s typical of the former it’s hardly the case with the latter. 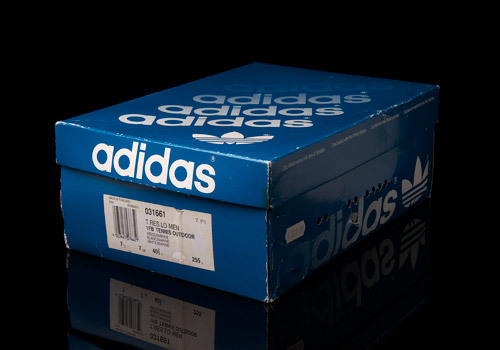 Digging deeper into the shoe the finer details show some interesting thinking: elastic bands (Run D.M.C. style) to hold the tongue in place even without being laced up, chunky plastic eyelet bits in an unusual format, and even more off the beaten path are the elongated (and rather thin) side stripes leading up to the eyelets (which, cracking apart, appear to be the weakest point of the design so far, when it comes to longevity). 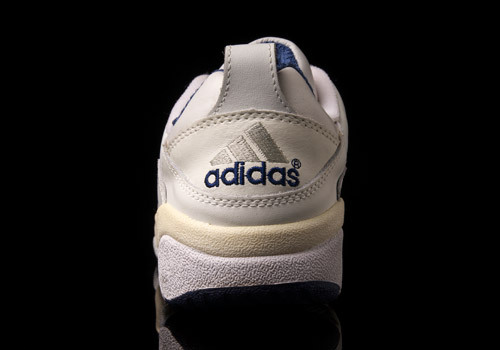 This last bit is actually a staple of the elderly ’90s shoes, having been present on quite a few fitness kicks from that time period (such as the not so well known Dorsey-M). But the most unique attribute of these Response Lows is the Torsion bar itself. 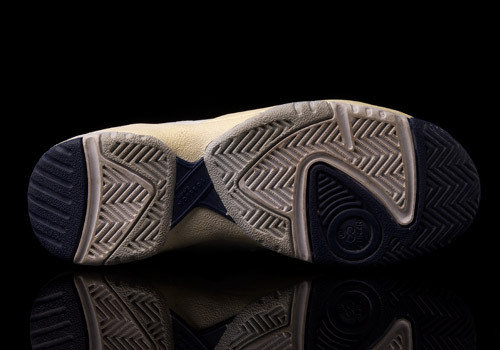 Normally depicted in the ‘barbell’ shape, we see a x-shaped twist here, lying between the two rubber pieces of the out sole. While this isn’t often seen it was resurrected quite recently in the form of the now quite healthily commercialized Torsion Allegra. Compare the out soles and we think you’ll see the similarities, at least in the area of the Torsion bar itself. Now don’t get these mixed up, as there are not only tons of Torsion models but in fact quite a large family of Torsion Response silhouettes alone. 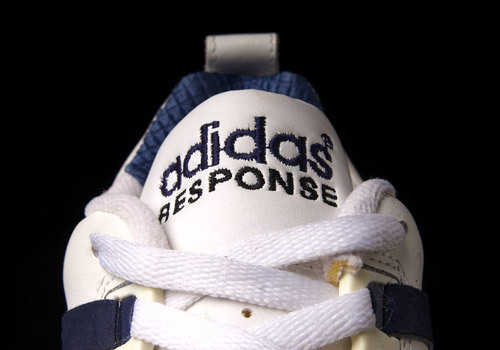 We’ve seen a Response Class from ’92 as well as a simple Torsion Response (no upgrade name) from around the same time of the early ’90s. 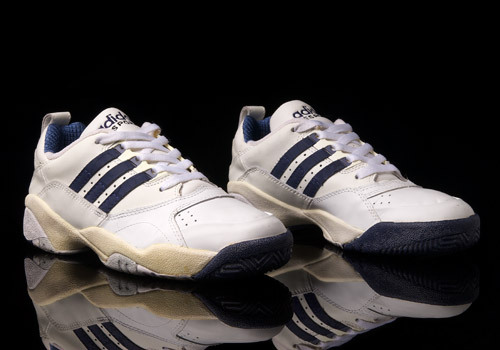 What distinguishes these from those though is much more than a simple word – ‘low’ – added to the name, as those other pairs are in fact designed, produced, marketed, and sold as runners, while the box for these (and of course their shape and build) clearly categorize them as an outdoor tennis trainer. 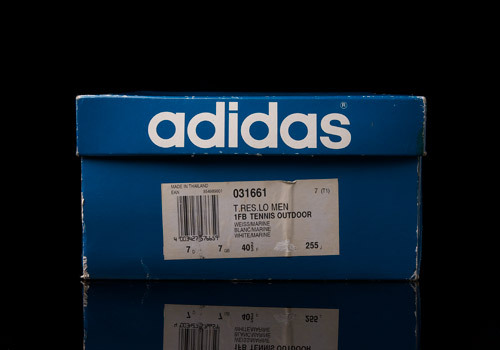 How adidas found it fitting to blur the lines so much is beyond us, but we certainly love the curiosity that such close model families fire up inside of us; it’s always enjoyable to have a good hunt.